Cooperation, often mandatory, carries risks as well as benefits. This photo-shopped image of Chinese president Xi Jinping holding a yellow umbrella, a reference to Hong Kong’s 2014 pro-democracy protests, is among several images thoroughly censored on Tencent’s WeChat application via blacklist and artificial intelligence, according to a recent study by the Toronto-based Citizen Lab. Last fall, the Chinese Communist Party declared its goal of turning China into a “cyber superpower,” with improved capabilities and influence in areas ranging from domestic censorship to global internet governance. The regime has made important progress since then, often with the help of Chinese and foreign corporations. But these gains come with a cost, not only to human rights and internet freedom, but also to the cooperating technology firms’ profits and reputations. Some aspects of the government’s innovation drive have clear public benefits. In August, for example, state-owned China Unicom successfully launched and tested its first high-speed 5G mobile network in Beijing, which it plans to roll out across the city by next summer. But other advances are more problematic. An August 14 report by the Toronto-based Citizen Lab revealed two forms of image censorship being deployed by the mobile application WeChat: One tool filters images containing sensitive text, and the other snags those that are visually similar to images already on a blacklist. Social media users have long posted images to circumvent censorship of simple text, and these new capabilities could close that loophole. Tencent, WeChat’s parent company, has taken a number of other steps since May to meet the government’s censorship demands. It has barred users from linking to external videos in chat groups, deleted large numbers of audio and video clips (including those deemed to “distort history”), and banned users from making changes to their profile pictures or user names—a common form of commentary—during the June summit of the Shanghai Cooperation Organization, the regional security bloc led by China. In the realm of surveillance, the western region of Xinjiang has become a laboratory for testing big-data, facial-recognition, and smartphone-scanner technologies that can eventually be deployed across China and beyond. Several firms have emerged at the cutting edge of this effort, including CloudWalk, Hikvision, Dahua, SenseTime, and Yitu. Although the work entails complicity in the oppression of Xinjiang’s Uighur Muslim population, it could give the companies a competitive edge on the international market, partly because access to large amounts of data can help train artificial-intelligence algorithms. For example, data and images of ethnic Chinese, Turkic Uighurs, and—under a new deal with Zimbabwe’s government—sub-Saharan Africans could collectively enable developers to correct common race-related errors in facial-recognition software and gain market share in other parts of the world. Chinese firms are already expected to control 44 percent of the global market for such technology by 2023. Chinese tech firms are not the only ones eager to please the leadership in Beijing. The government is adept at using the lure of its enormous domestic market—now consisting of over 800 million internet users—to extract concessions from foreign firms, including assistance with its censorship and surveillance system. The recent controversy surrounding Google’s plans to develop a censored search engine for the Chinese market is only the latest among many examples of such cooperation. But in a newer and more disturbing development, the Chinese government has used market leverage—and in some cases arbitrary blocking and other regulatory actions—to spur censorship of information available to people outside China. In a spate of incidents over the spring and summer, hotel, airline, and automobile companies changed their presentation of content on topics like Tibet or Taiwan to fit Beijing’s political positions. A piece of code in Apple’s iPhone operating system that was meant to prevent Chinese users from displaying the Taiwan flag emoji recently caused phones with China location settings to crash, even if the device was being used in San Francisco. Apple is now weighing the inclusion of China’s Beidou navigation system on the next generation of iPhones; one can already imagine how its maps will handle Beijing’s territorial claims. As Chinese and foreign companies take more steps to appease the regime, the human toll will continue to mount. Censorship and surveillance on sensitive topics like Taiwan, Tibet, Xinjiang, Falun Gong, and the 1989 Tiananmen massacre either whitewash or exacerbate large-scale human rights violations—including mass detentions, torture, and extrajudicial killings. Beyond that, annual Freedom House analysis of leaked censorship directives has repeatedly shown that a broad range of breaking news topics are targeted for control, including vital information on public health and safety. But ironically, the complicit companies themselves are also important victims of the government’s repressive measures, enduring a number direct and indirect costs as a result of state abuses. First, the arbitrary nature of Chinese regulatory decisions can wreak havoc on the best-laid business plans and nascent successes. In July, it seemed briefly that Facebook had gained government approval to open a subsidiary and innovation hub in Zhejiang Province, no doubt after long and arduous negotiations. But within hours, the registration announcement disappeared and was censored in Chinese media, apparently because the CAC vetoed the local government’s decision. Second, the Chinese government’s ever-increasing censorship and surveillance demands reduce profit margins. Actions like moving data service centers from overseas to China and partnering with local companies—as required under the new Cybersecurity Law and implemented by companies like Apple and Evernote—are not inexpensive endeavors. Neither is rapid expansion of censorship staff, as Toutiao announced following its suspension in April; the company increased the number of editorial monitors from 6,000 to 10,000 and established a special committee to manage a politicized content overhaul. Third, while close government ties are a necessity in China, they provoke scrutiny, distrust, and skepticism abroad. More foreign governments and civil society groups now object when Chinese firms seek to build critical infrastructure or provide important technology and services. Last month, Australia blocked Huawei and ZTE from building the country’s 5G network, citing security risks. A U.S. defense spending bill signed into law on August 13 banned federal agencies from purchasing equipment made by Hikvision, Dahua, Huawei, or ZTE. And on September 18, broadcasters in Ghana raised concerns about the government’s talks with a Chinese company on a contract to build the country’s digital television infrastructure. Meanwhile, Google’s reputation has taken a hit from the revelations about its Chinese search engine project, with some top employees resigning in protest. Both Chinese and foreign firms are caught between a rock and a hard place. As they compete for profits and market share, they must navigate between the legal regimes and political demands emanating from Beijing on the one hand and democratic societies on the other. The Chinese Communist Party has laid out its own plans and ambitions, and it shows every sign of implementing them to the fullest. The question is whether the United States, other democracies, tech entrepreneurs, and investors will assert their own principles—including freedom of expression, free enterprise, and the rule of law—with equal determination. If they do not, technology companies will lead the world down a path charted by Beijing, and the freedom of all people will suffer for it. Harsh prison sentences: Tibetan language activist Tashi Wangchuk was sentenced to five years in prison on May 22 for “inciting separatism”; his appeal was rejected on August 23. The primary piece of evidence used against him was a nine-minute New York Times video documentary from 2015 about his fight to preserve the Tibetan language. Separately, on July 11, veteran democracy activist Qin Yongmin, 64, was sentenced to 13 years in prison for “subversion of state power,” having led a prodemocracy group that circulated online statements criticizing government policy. Sentences pending: On August 7, Liu Feiyue, the founder and director of the rights-monitoring website “Civil Rights and Livelihood Watch” (Minsheng Guangcha), stood trial for “inciting subversion of state power.” On August 10, authorities held a trial in Zhuhai for anticensorship activist Zhen Jianghua on charges of “inciting subversion of state power.” Zhen is the founder of several rights-focused websites—most recently “Scale the Wall Net” (Fanqiang Wang), a site offering technical assistance for internet users seeking to circumvent censorship—and had been detained in September 2017. Physical abuse: Radio Free Asia reported on September 7 that Sichuan Province prosecutors have subjected rights activist Huang Qi to physical violence for his refusal to plead guilty to “leaking state secrets overseas,” according to his defense attorney. Huang was formally arrested in December 2016 and has reportedly suffered poor health in detention, including deteriorating kidney function. His trial, originally scheduled for June, has been repeatedly delayed, and his family has expressed fears that he could die in custody. Travel restrictions: Authorities in Jiangsu Province this month placed a travel ban on rights activist Shi Jing, who had planned to observe Taiwan’s local elections in November. Police questioned him in Nanjing during the weekend of September 8, told him not to “post or say anything inappropriate,” and warned that his phone and WeChat account were being monitored. Visas denied: BuzzFeed’s Megha Rajagopalan, who has been reporting from China for six years, announced on Twitter on August 21 that due to the Foreign Ministry’s failure to issue her a new visa, she would not be returning to Beijing. Rajagopalan had won a human rights reporting award for her coverage of the surveillance and oppression of Muslim minorities in Xinjiang. Separately, David Missal, a German graduate student at Tsinghua University’s School of Journalism and Communication, learned in early August that his application to renew his student visa had been denied by the Beijing Public Security Bureau and that he had 10 days to leave China. Missal had chosen to study the crackdown on rights lawyers that began on July 9, 2015. He believes that research may be the reason for his effective expulsion from the country. Arrests and prosecutions for social media content might become more common, at least in the Guangzhou area, after the People’s Court of Nansha District issued judicial procedures allowing WeChat and QQ chat records to be used as key evidence for proof of crime on July 19. Despite the Chinese authorities’ usual intransigence in the face of international pressure, persistent global campaigns on behalf of Chinese prisoners of conscience can yield results. The most notable recent example is the release of Liu Xia, widow of deceased Nobel Peace Prize laureate Liu Xiaobo, from house arrest, and the approval for her to travel to Germany on July 10. State and party authorities worked during the summer to implement President Xi Jinping’s calls for more “positive energy” in the arts and entertainment industry while restricting content deemed to have a negative impact on citizens. Summer programs should display “positive energy”: On July 10, the State Administration of Press, Publication, Radio, Film, and Television (SAPPRFT) ordered all entertainment-sector authorities to ensure that multimedia websites produce summer programming that brims with “positive energy,” “illustrates socialist core values,” and “promotes China’s outstanding traditional culture,” while “strictly controlling programs, and monitoring and cleaning up harmful and vulgar content that could infringe on the physical and mental health of the youth.” An apparent early casualty of the SAPPRFT directive was the Chinese version of the American sketch-comedy show Saturday Night Live, which was pulled from the air less than a month after its debut. The cancellation of the program has been described by some outlets as temporary; others have noted the apolitical nature of the short-lived show compared with its U.S. counterpart. Building a list of influential online celebrities: Local internet authorities in Zhumadian, Henan Province, took measures to reinforce the “positive energy” of highly influential internet celebrities, including so-called “Big V” microbloggers. An internal notice issued by the Zhumadian branch of the Cyberspace Affairs Commission directed lower authorities to “report a list that contains Weibo and WeChat names, real names, positions at work, number of fans, contact numbers, etc. of internet Big Vs that have more than 10,000 followers [and] a list of important Big Vs and internet celebrities that your department usually focuses on to the municipal Cyberspace Affairs Commission office." The notice said that the reports would be part of a campaign to more effectively manage internet celebrities. Actress Fan Bingbing’s disappearance provokes censorship: Chinese actress and model Fan Bingbing—long one of China's highest-paid and most widely known celebrities—has disappeared from public view. Her last public appearance was in a promotional video she recorded for De Beers that was posted on YouTube in late May. On May 28, presenter Cui Yongyuan of state-run China Central Television used a Weibo account to reveal two purported “yin-yang contracts”—documents allegedly used in China’s entertainment industry to underreport a star’s earnings to the authorities—that bore Fan’s name. Tax authorities launched an investigation, though Fan denied that she had evaded taxes, and Cui's allegations quickly fell apart. Fan has not been seen publicly in months. Her Weibo account remains active, but she hasn’t posted since June 2. Meanwhile, according to China Digital Times, a leaked June 9 propaganda directive ordered websites to stop covering the tax-evasion practice. And in September, Fan was ranked dead last on an annual “China Film and Television Star Social Responsibility Report” compiled by a state-affiliated think tank. Brands that she represents have sought to distance themselves from the actress, and she has been removed from promotional posters for some upcoming releases. HBO, Winnie the Pooh, German play restricted: Foreign cultural and entertainment content has drawn the attention of state censors in recent months. On June 20, British comedian John Oliver presented a 20-minute segment on his HBO show Last Week Tonight in which he took President Xi Jinping to task for his repressive policies. Shortly afterward, HBO joined the list of foreign media outlets whose websites are censored in China, and many keywords related to the program and host were censored from searches and banned from posts on Weibo. Reuters reported on September 20 that regulators were planning to ban foreign current-affairs programs entirely. 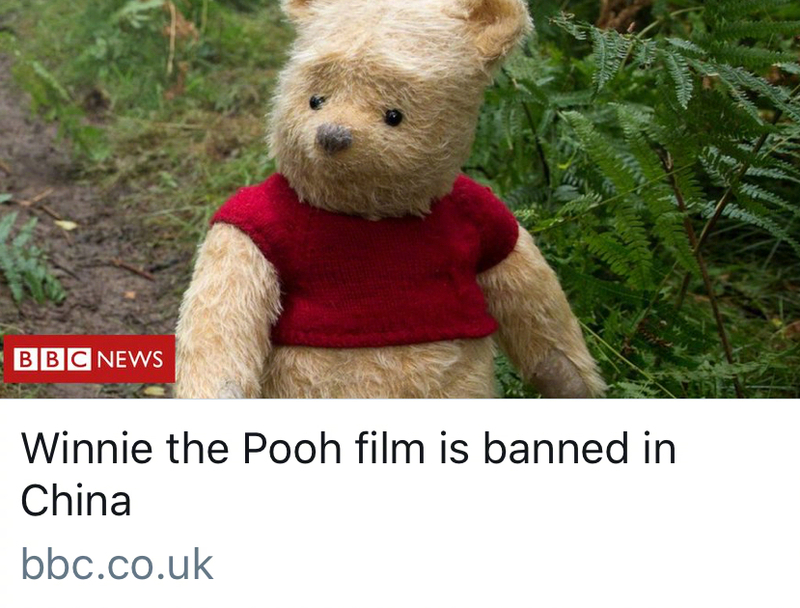 Separately, the new Hollywood film Christopher Robin was denied entry to China. While this could simply be a result of the current foreign film quota, which allows only 34 foreign movies to be screened in China each year, the political sensitivity surrounding Winnie the Pooh was likely a factor—Chinese netizens have long likened Xi to the cartoon bear, despite the objections of Communist Party officials. In September, a Nanjing theater that had been scheduled to host a German production company’s performance of the 19th-century Norwegian play An Enemy of the People canceled the show, citing technical problems. The production company’s executive director noted that at previous Beijing performances, the audience had compared the play’s subject to contemporary freedom of speech issues in China; he argued that this probably led to the cancellation of the Nanjing debut. Refuting “rumors”: On August 29, China’s Central Cyberspace Affairs Commission launched an online platform allowing the public to report “online rumors.” The Piyao (literally, “refute rumors”) platform, operated by the state-run news agency Xinhua, includes a mobile app and associated accounts on Weibo and WeChat. Its aim is to disseminate “real” news as reported by state media and government agencies and counter “rumors” that challenge the official narrative. Such dissent can be punished with prison time in China. Deleted news: China’s censorship apparatus has been busy deleting newsworthy information and analysis. In July, China Digital Times translated a leaked propaganda directive ordering news websites to significantly tone down coverage of a tainted vaccine scandal that had led parents to protest. Censors also targeted news and WeChat coverage of a bomb that detonated outside the U.S. embassy in Beijing on July 26, and shut down comment sections on all websites covering a September 6 speech in which President Xi Jinping promised $60 billion in aid to Africa. China Digital Times also translated censorship directives ordering no further coverage of nationwide truck drivers’ strikes on June 11, an African swine fever outbreak on August 26, and a tragic suicide by a debt-ridden farmer amid massive flooding in Shandong Province on August 28. Meanwhile, Jamestown China Brief editor Matt Schrader reported on Twitter that a friend in China had been reported to the authorities by his boss after he tried to share a July data study by Twitter user @AirMovingDevice, which analyzed the frequency of front-page People’s Daily mentions of top Chinese leaders. The study found that Xi had been mentioned nearly every day of his tenure—which the researcher said is close to Mao Zedong’s record during the Cultural Revolution. Expanding surveillance and smartphone scanners: Cutting-edge surveillance technologies that were tested in the Xinjiang region have reportedly spread across China over the past year. One system that has increasingly appeared outside of Xinjiang is a handheld data-extraction device that police can plug into citizens’ mobile phones to copy and analyze personal information, according to a Reuters investigation published on August 14. 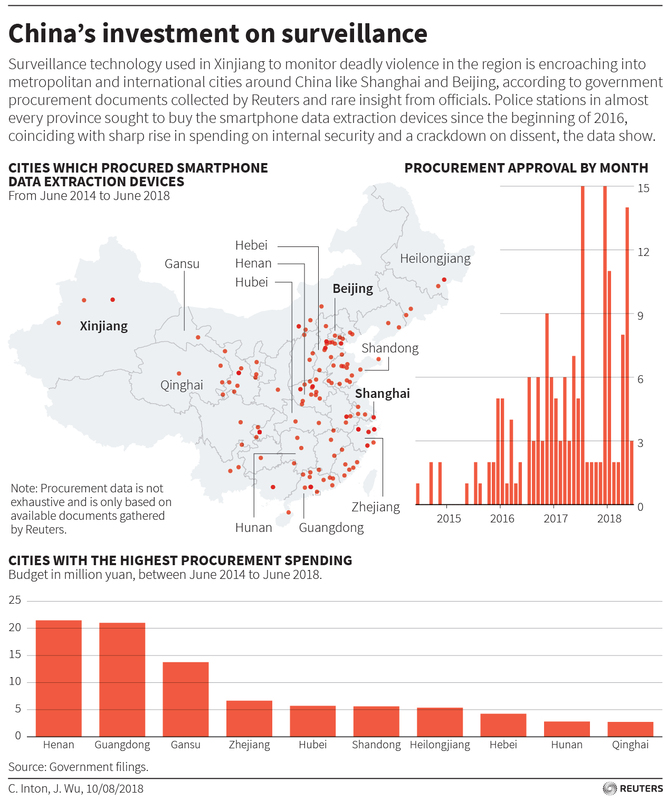 Procurement records obtained by Reuters indicated that since early 2016, “police stations in almost every province have sought to buy the data-extraction devices for smartphones.” Other emerging surveillance technologies include radio-frequency identification tags on private vehicles, infrared cameras to detect illegal burning by farmers, and facial-recognition cameras in public schools to monitor students’ behavior, attentiveness, and emotional responses. Google plans for a censored search engine: On August 1, the Intercept reported on leaked internal documents from Google that detailed a long-running plan to launch a censored search engine in China. The news came eight years after the company decided to cease complying with Chinese censorship, earning it resounding applause from rights advocates and technology experts. The revelation of the new project, codenamed Dragonfly and kept secret from many Google staffers, led to mass protests from employees (some of whom quit) and rights organizations. It also prompted an inquiry from a bipartisan group of U.S. lawmakers. According to a second Intercept investigation published on September 14, in addition to including an embedded list of forbidden search terms like “human rights” and “Nobel Prize,” the Dragonfly prototype linked its mobile app to the user’s phone number, which could make it easier for the Chinese government to monitor individual citizens’ searches. Soon after the 21st anniversary of Hong Kong’s handover from Britain to China in July, the Hong Kong Journalists Association (HKJA) published its annual report on press freedom in the semiautonomous city. The report expressed particular concern about pressure from Beijing to pass national security legislation that would outlaw some forms of expression. The report also noted important changes in media ownership, restrictions on access to government information, and self-censorship in the Hong Kong media. Former Hong Kong chief executive sues outlet for defamation: On August 24, Leung Chun-ying, the former chief executive of Hong Kong and a National Committee vice chairman in the Chinese People’s Political Consultative Conference, lodged a libel complaint against the online outlet Stand News as well as Hong Kong Polytechnic University professor Chung Kim-wah. Leung objected to an article written by Chung and published by Stand News that alleged ties between Leung and organized crime. The chief editor of Stand News rejected the idea that the article was defamatory, while the HKJA criticized Leung’s repeated use of legal pressure and urged him to “be honest and open by telling the whole truth and responding directly to contents of the articles he considers as defamatory.” Over 600 public figures and citizens in Hong Kong signed a petition accusing Leung of using lawsuits to suppress freedom of speech. Foreign Correspondents’ Club hosts speech by independence advocate: Andy Chan Ho-tin, the convenor of the proindependence Hong Kong National Party, ultimately gave a scheduled speech at the Foreign Correspondents’ Club (FCC) on August 14 despite intense pressure from Chinese and Hong Kong authorities to rescind the invitation. The acting Hong Kong chief executive, Matthew Cheung, had stated that it was “inappropriate and unacceptable” for the FCC to host Chan, while the management of RTHK, a taxpayer-funded broadcaster, announced internally that there would be no broadcast or streaming of the talk. Even China’s Ministry of Foreign Affairs, through its Hong Kong office, remonstrated with the FCC to cancel Chan’s appearance. The club went ahead with the event, explaining that hosting a speaker does not amount to an endorsement of the views expressed. Hong Kong journalist arrested in Beijing: Chui Chun-ming, a cameraman with the Hong Kong outlet Now TV News, was wrestled to the ground, handcuffed, and taken away bleeding by Chinese police while attempting to report on prominent human rights lawyer Xie Yanyi’s disciplinary hearing in Beijing on May 16. Chui was released later that day after being forced to sign a letter expressing regret for his actions. The HKJA criticized Hong Kong chief executive Carrie Lam for her “tepid response” to the incident after she failed to specifically condemn the police violence and merely called for “mutual respect.” Since the arrest, Hong Kong press groups and media unions have written to the Chinese authorities to condemn Chui’s treatment and demand an end to violence against Hong Kong journalists working in China, while the HKJA delivered a point-by-point rebuttal of an explanation for the arrest provided by the Beijing Public Security Bureau. Chinese officials sit in on Hong Kong paper’s editorial meeting: Three officials from the Chinese Ministry of Foreign Affairs attended the South China Morning Post’s August 30 editorial meeting in an “unpleasant surprise” that was first reported by the Paris-based press freedom watchdog Reporters Without Borders. The officials observed the meeting as part of a farewell for the ministry’s spokesperson in Hong Kong. Reporters Without Borders noted that an editorial meeting “is a sensitive occasion” and said the presence of Chinese officials would naturally be perceived by journalists as “a form of intimidation.” It is unclear who at the newspaper invited the officials and authorized their attendance. The South China Morning Post was acquired by the mainland e-commerce giant Alibaba in late 2015. New external propaganda chief: The Chinese Communist Party in late August appointed Xu Lin to lead the State Council Information Office, also known as the party’s Office of Foreign Propaganda. He had served as head of the Cyberspace Administration of China since 2016, when his predecessor there, Lu Wei, was ousted for alleged corruption. Xu, a former aide to President Xi Jinping when Xi was party secretary of Shanghai, will be tasked with improving China’s global reputation at a time when it has come under greater scrutiny for human rights abuses, unfair trade practices, and military aggression in the South China Sea. South African column canceled after commentary on Xinjiang: Growing media cooperation between China and African countries is raising concerns about censorship. In a September 14 article in Foreign Policy, Azad Essa—a contributor to Independent Media, the second-largest media company in South Africa—describes how his weekly column was canceled the day after he wrote about the mass detention of Uighur Muslims in Xinjiang; the article in question was not uploaded online after appearing in print. Essa, who had been contributing articles for two years, was told merely that a “new design” at the company’s newspapers necessitated the elimination of his column. He notes that firms with ties to the Chinese state own 20 percent of the company. Separately, on September 18, broadcasters in Ghana raised concerns about a potential $95 million government contract that would authorize the Chinese company StarTimes to build the country’s digital television infrastructure. The Ghanaian Independent Broadcasters Association called on the government to use local firms instead, lest Ghana “virtually submit” its broadcast sector to Chinese control and content. Mexican radio station may be sold to pro-Beijing firm: The potential sale of a radio station in Mexico to a Hong Kong–based broadcaster has raised the possibility that pro-Beijing propaganda could reach cities in Southern California via AM radio. On September 11, Senator Ted Cruz called on the Federal Communications Commission to block the sale under the provisions of a 1992 agreement with Mexico. The reported buyer is a subsidiary of the Hong Kong–based Phoenix TV, which has close ties to Chinese officials and security agencies and typically favors the Communist Party leadership in its coverage. In recent years, it has been used as an outlet for televised confessions by detained party critics. United States restricts funding for colleges with Confucius Institutes: The U.S. Defense Department’s 2019 funding bill, which was signed into law on August 13, includes a prohibition on language funding for universities with Confucius Institutes. It stipulates that the authorized federal funds cannot be “expended to support a Chinese language program at an institution of higher education that hosts a Confucius Institute.” Universities can obtain waivers if certain conditions are met, including transparency surrounding the Confucius Institute contract and guarantees that no Confucius Institute instructors will be involved in the government-funded program. The prohibition has already begun affecting universities in the country, with STARTALK, a Chinese-language program funded by the National Security Agency, recently informing its host universities that they must certify their compliance. The National Association of Scholars, which has called on U.S. colleges to close Confucius Institutes, has come out in support of the new rule. Chinese state media told to register as foreign agents in United States: On September 18, the Wall Street Journal reported that the U.S. Department of Justice had ordered China’s official Xinhua News Agency and China Global Television Network (CGTN)—the international version of state broadcaster China Central Television—to register under the Foreign Agents Registration Act (FARA). China Daily, a state-run English newspaper, has long been registered under FARA, and in recent months various observers, including Freedom House, had asked why the two other leading Chinese state media outlets that disseminate content to U.S. audiences remained unregistered. The practical implications of the move remain unclear, but after the Russian state outlet RT registered as a foreign agent in 2017, it lost its congressional press credentials, which both Xinhua and CGTN currently possess. The oppression of the ethnic Uighur minority in Xinjiang is one of the most censored topics in China. Foreign journalists are often barred from visiting the region or forced to leave China for reporting on it. Keywords related to Xinjiang are systematically censored, and both Uighur and ethnic Chinese residents who send information abroad have been sentenced to long prison terms. Nevertheless, in recent months, escalating abuses against Uighurs and other Muslim minorities in Xinjiang—including the internment of hundreds of thousands of people in extralegal facilities for political and religious indoctrination—have made international headlines and provoked credible threats of sanctions against the Chinese officials responsible. This much-needed attention can be attributed in large part to the dedication of those working to expose human rights violations despite potential reprisals from the Chinese government. Radio Free Asia journalists have engaged in intrepid reporting and made inquiries with local officials despite having family members abducted in retribution. Foreign scholars have dug through Chinese government websites to expose security spending and offered credible accounts of the havoc the detention camps are wreaking on their network of contacts, despite the risk that they could be deprived of visas and lose access to a region they have dedicated their careers to studying. Uighurs who have escaped the camps have provided first-hand accounts of abuse and deaths in custody to human rights groups and foreign journalists. And several creative netizens have successfully tapped Google Earth satellite imagery and official WeChat accounts to collect evidence that can be used by professional journalists. As the Chinese government has become aware of the online paper trail fueling international scrutiny of the camps, it has begun efforts to delete the records. A small number of scholars, independent researchers, and journalists are now using tools like Google Wayback to seek out and archive them. In the coming months, the international community will show whether it can translate overwhelming evidence into concrete action that forces the Chinese government to ease its repression. Sentences for online activists: Following the August trials of rights website manager Liu Feiyue and blogger Zhen Jianghua, watch for news of their sentencing and any sign that officials were influenced by international pressure on their behalf. Investor reactions to tech firm troubles: Both Chinese and foreign government actions often directly affect the market value of technology companies. The share prices for Hikvision and Dahua dropped noticeably after the August adoption of U.S. legislation banning the purchase of their products by federal agencies. By contrast, investors tend to reward closer collaboration with the Chinese government. Hikvision and Dahua stock recovered after an announcement by the Chinese government hinted that it would assist the companies. Shares in Alphabet, Google’s parent company, opened higher after reports that Google was preparing to launch a censored search engine in China; the stock of Baidu, Google’s Chinese rival, suffered amid the speculation that it would face greater competition. Watch for other examples of how markets respond to government or corporate actions that support or restrict internet freedom. U.S. Senate bill to reimpose ZTE sanctions: On September 18, a bipartisan group of senators led by Marco Rubio (R-FL) and Chris Van Hollen (D-MD) introduced a bill that could reinstate crippling sanctions against Chinese telecommunications giant ZTE, which President Donald Trump had lifted in May. Under the bill, the sanctions will come into effect if the company violates any of the probationary conditions it agreed to in a deal with the Commerce Department, including illegally exporting products to Iran or North Korea. Watch for whether the bill is adopted by lawmakers and signed by the president in its current form. Access uncensored content: Find an overview comparing popular circumvention tools and information on how to access them via GreatFire.org, here or here. Learn more about how to reach uncensored content and enhance digital security here. Support a prisoner: : Learn how to take action to help journalists and free expression activists, including those featured in passed issues of the China Media Bulletin here. Visit the China Media Bulletin Resources section: Learn more about how policymakers, media outlets, educators and donors can help advance free expression in China and beyond via a new resource section on the Freedom House website.